Should The Legend of Zelda's Link finally join the rest of the voice-acted videogame world? Producer Eiji Aonuma doesn't think so. Once upon a time, the closest thing videogames had to voice acting was Sinistar. The only dialogue was in text bubbles, and fully voice-acted games were the exception rather than the rule. Sometime around the turn of the century, this began to change. Now, it's rarer to find a full-production non-handheld game that doesn't have voice acting than one that does. Several series, however, ardently remain standouts - and The Legend of Zelda is one of them. Sure, Link started yelling stuff like "Hya! Orya! Huuuhngh!" in Ocarina of Time, but we've never actually heard the green-clad hero say anything beyond his grunts and yelps. Does that bother some people who think that Zelda needs to get with the times? Perhaps, but one of those people isn't Skyward Sword producer Eiji Aonuma. 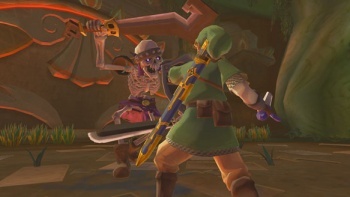 "Personally, I don't want to have Link speak in the game," said Aonuma in Nintendo Power. "We haven't had him talk at all up to this point. It's part of the series history. It would just, to me, break the image of Link to have him speak." "In terms of other characters, if Link never talks and everybody else in the game is chatting and whatnot I also think that's sort of an off mixture, so it's not something that, to be honest, I've really thought I want to be superactive about or I've really pressed for it. It just hasn't come up to me personally." You know, perhaps this isn't such a bad thing after all.